After drugs were found aboard the Ping May, a vessel owned by his wife’s family’s company, Colombian authorities are investigating. Before the Ping May, a rusty cargo vessel, could disembark from the port of Santa Marta en route to the Netherlands in late August, Colombian inspectors boarded the boat and made a discovery. Hidden in the ship’s chain locker, amidst its load of coal bound for Europe, were approximately 40 kilograms, or about ninety pounds, of cocaine. A Colombian Coast Guard official told The Nation that there is an ongoing investigation. McConnell’s ties to the Chaos go back to the late 1980s, when James Chao began donating to the senator. In 1993, McConnell married James’s daughter, Elaine Chao, a Republican activist and former Reagan administration official who would later serve as secretary of labor in the George W. Bush cabinet. James Chao emigrated to the United States from Taiwan, and founded the Foremost Maritime Corporation upon settling in New York. 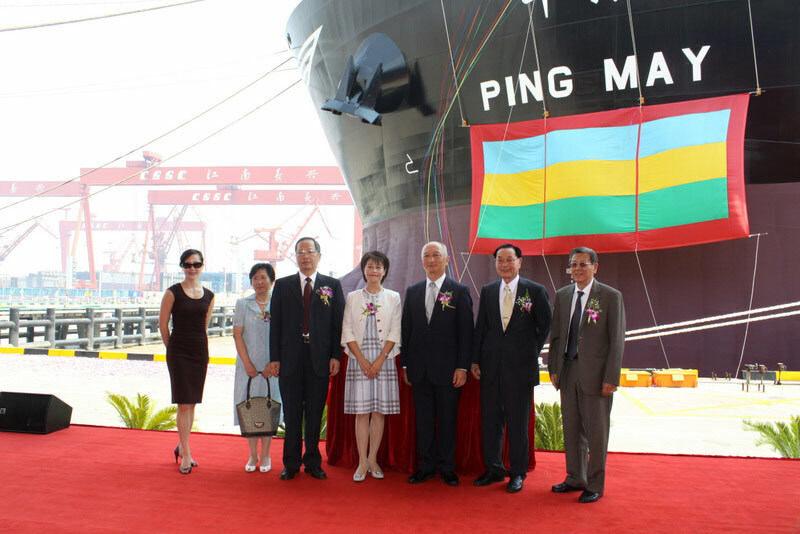 The company has grown significantly over the years, from acting as maritime agent during the Vietnam War to controlling a fleet of approximately sixteen dry-bulk cargo ships in operation today. Foremost acts as a shipping agent, purchasing vessels made primarily in China and coordinating shipment of commodities. Records reviewed by The Nation reveal that Foremost transports corn, chemicals and other goods to cities throughout the world. The company has offices in New York and Hong Kong. Some of the goods shipped by Foremost echo themes of the McConnell campaign. At a Young Professionals Association of Louisville event this month, McConnell stressed his opposition to carbon dioxide limits imposed by the federal government that would impact the domestic coal market. He argued that such efforts would be fruitless given the role of coal in developing countries and the rising coal trade. Foremost ships routinely transport coal from ports in Australia and Colombia, countries with cheap coal, for export to Asia and Europe. The firm, however, leaves a faint online trace. Foremost’s website FMCNY.com is blank. 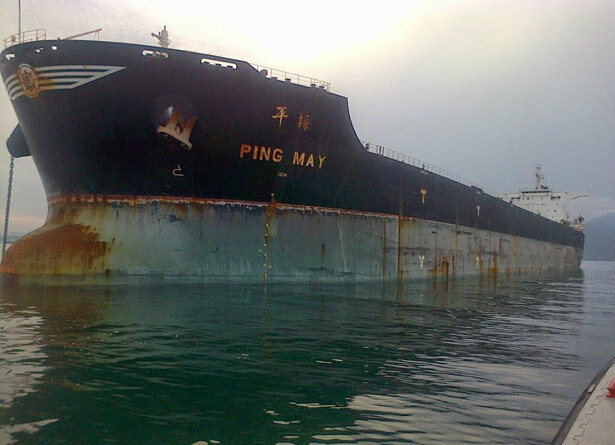 Records and court documents obtained by The Nation show that the ownership of the company’s vessels—with names such as Ping May, Soya May, Fu May and Grain May—is obscured through a byzantine structure of tax entities. Most of Foremost’s vessels are flagged in Liberia, which ensures that crew members of Foremost’s ships work under Liberia’s maritime labor laws, which critics note allow for intimidation in the workplace and few protections for labor unions. In addition, a Liberian “flag of convenience” allows ship owners to pay lower tonnage taxes than ships that fly the US flag. Maritime companies have increasingly used the Marshall Islands to register their vessels. The jurisdiction boasts of “no taxation, lax regulation, and no requirements for disclosure of many corporate details—even to the United States government,” according to a report in World Policy Journal. The recent seizure of cocaine on a Foremost coal ship came as authorities in Colombia have stepped up anti-drug trafficking enforcement in the region. The Nation spoke to Luis Gonzales, an official with the Colombian Coast Guard in Santa Marta, who told us that the Ping May’s crew were questioned as part of an ongoing investigation, but that no charges have yet been filed. His team found the cocaine in forty separate packages. McConnell has benefitted in many ways from his relationship with his in-laws. The Republican Senate minority leader’s personal wealth grew seven-fold over the last ten years thanks in large part to a gift given to him and his wife in 2008 from James Chao worth between $5 million and $25 million (Senate ethics forms require personal finance disclosures in ranges of amounts, rather than specific figures). The gift helped the McConnells after their stock portfolio dipped in the wake of the financial crisis that year, and ensured they could pay off more than $100,000 in mortgage debt on their Washington home. The generous gift made McConnell one of the wealthiest members of the Senate, with a net worth averaging around $22.8 million, according to The Washington Post’s review of his financial disclosures. Following the gift, McConnell sent a letter of congratulations to an auditorium of Chinese officials in Shanghai who were gathered for an event honoring James Chao’s wife (McConnell’s mother-in-law, Ruth Mulan Chu Chao, who passed away in 2007). The Shanghai Mulan Education Foundation, created in her honor, regularly hosts students from the University of Louisville, where McConnell has a leadership academy bearing his name that sends students on trips to China. The ties between McConnell and his in-laws have come under scrutiny before. In 2001, they were probed in depth by The New Republic in an article that charged that McConnell led an effort to soften his party’s criticism of China. Through James Chao, who was a classmate of Jiang Zemin, the president of China in the ’90s, McConnell and his wife met with Jiang several times, both in Beijing and in Washington. McConnell subsequently tempered his criticism of Chinese human rights abuses, and broke with hawks like Senator Jesse Helms to support Most Favored Nation trading status with China. As Foremost established closer ties with mainland China, McConnell endorsed the position that the United States should remain “ambiguous” about coming to the defense of Taiwan. 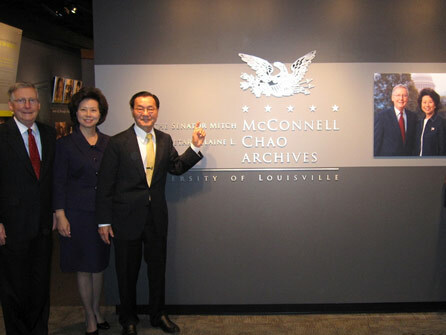 In 1999, McConnell and his wife appeared at the University of Louisville with Chinese Ambassador Li Zhaoxing. Li used the opportunity to bash congressional leaders for rebuking China over its repression of the Falun Gong religious sect. “Any responsible government will not foster evil propensities of cults by being over-lenient,” Li reportedly said at the event with McConnell and Chao. Rather than distance himself from the remarks, McConnell reportedly spoke about his “good working relationship” with Li. Last Friday, McConnell dipped into his personal fortune to lend his own campaign $1.8 million for the final week before the election. Members of the Chao family and employees of Foremost have also given over $90,000 in contributions to McConnell over the years. Requests for comment to the McConnell team about the Ping May cocaine incident have gone unanswered. In recent weeks, McConnell has touted his role in calling for more federal money to be used for drug enforcement.